Hello friends. Rainy Sunday. Helped DH scrub the back decks. Green and black stuff is gone. Yearly job. Clean the deck, paint the deck. Check out the rails, remove bubbled paint, scrape, dry, repaint. Maybe by this time next week the job will be finished. The deck coat and the fresh paint are waiting by the back door. Garage Sales this weekend? Some unique to me finds. The wooden cog wheel was the most original. I'm always happy when I find another zinc/tin watering can. I left the dirt in place. Added a darning egg/form and a vintage teaplate add to the mix. Love vignettes. 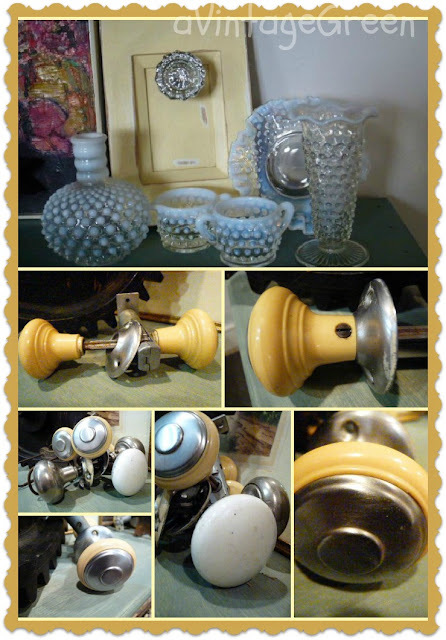 Next up - vintage doorknobs and Anchor Hocking Moonstone glass (1941-1946). The yellowed and metal knobs are early plastic (1950's I'm guessing). The white is porcelain. The glass door knob was already on the wooden frame - it will make a good wall hook or a background for a vignette. I just noticed that my 'watermark' slipped up when I saved the collage. Fun finds, a vintage Brownie Target Box Camera (haven't found one for several months) and a lovely old frame with 'turn' feet. Dug out The Archive, well patinated and somewhat rusty paper holder. I love the clear lettering. 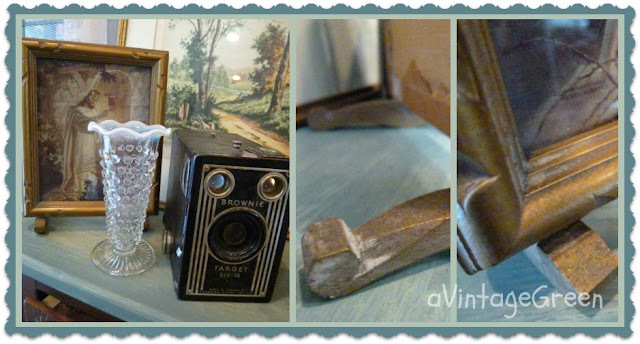 Mixing it with the wooden cog, and vintage doorknobs makes a very masculine vignette. 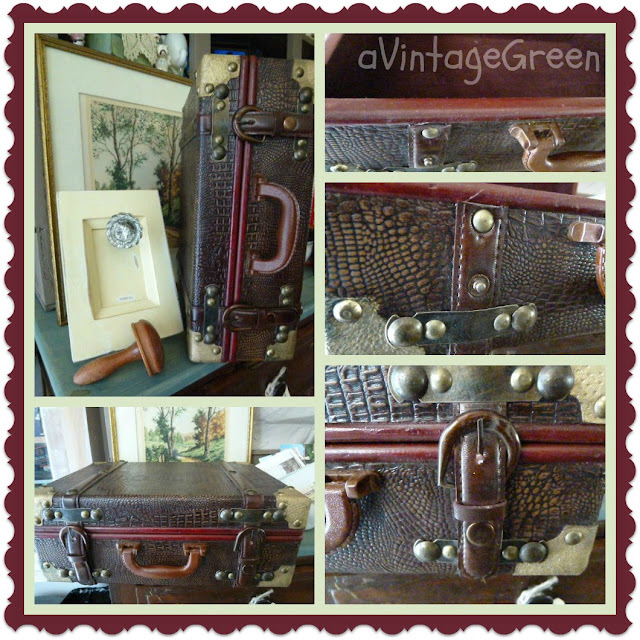 The last collage today is a great 'faux' suitcase. I think, from the burgundy flock lining, that it may have been a 5 track tape holder (well, maybe). At first glance it is is just plain funky, lots of faux metal corners, faux leather straps, faux belt closures (really just snap closures covered by the belt look. Looks like alligator (faux, just plastic). The rim is bamboo. Totally fun. Great display piece in a vignette. For the past few weeks all I seem to be posting is vignettes. Thats not a bad thing, just that my 'do something' creativity is tied in to house cleaning, cleaning and re-organizing in the sheds, working on organizing all the 'stuff that needs a home' and not in to 'making' something new/unique/etc., plus gardening work. We are collectively getting some painting done in DGS's room (since it was my sewing room and I loved 'peach' paint), it is now being turned into his favourite 'blue' with brown curtains. Just have to change out the sheets and duvet to brown and find somewhere to store my stuff in another space. We are also refreshing the basement bathroom. Its now on its 3rd coat of lovely fresh white. Gone are the partly painted white over peach walls and the bright green door and window trim (a surprise from DS when I came home to one day a few years ago, not my choice). Do you ever get surprises that take hours and hours to redo, sometimes years later? Have A Daily Cup with Mrs. Olson who featured this post on her blog. You had some awesome finds, Joy! Lots of eye candy on this post! Thanks for stopping by my finds post, too! What fun! Great finds and really nice vignettes. Your photos and collages are really lovely, Joy. Oh, my list of things to do around here is endless. And I haven't done anything on the list! fabulous vignettes! They are so lovely. 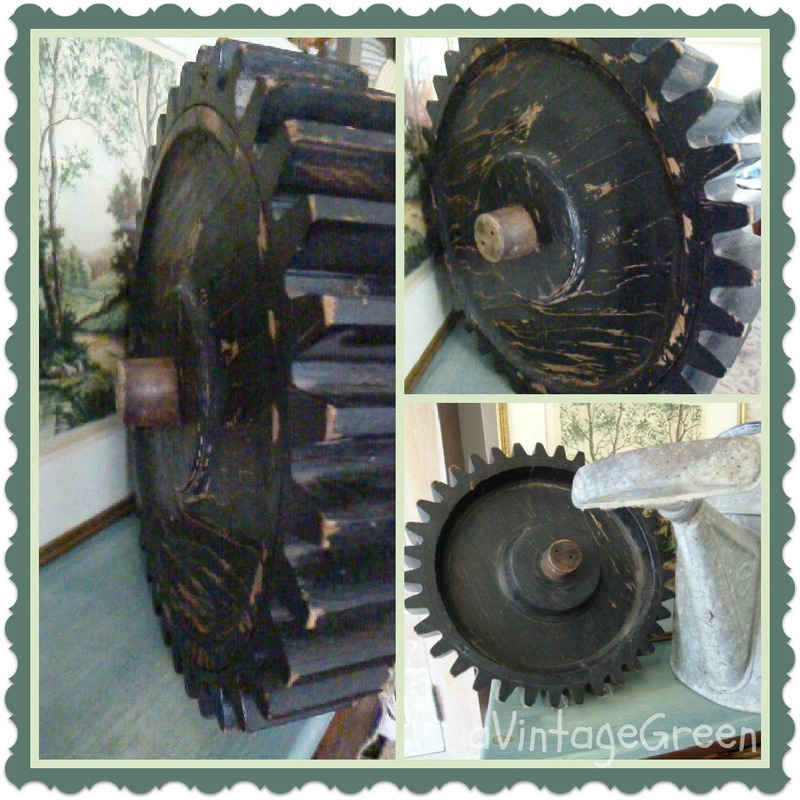 That wooden cog wheel is a really great find! So unusual and it has great visual appeal. So many lovely things to look at! I love the watering can and the yellow doorknobs. I haven't run across any like those before. 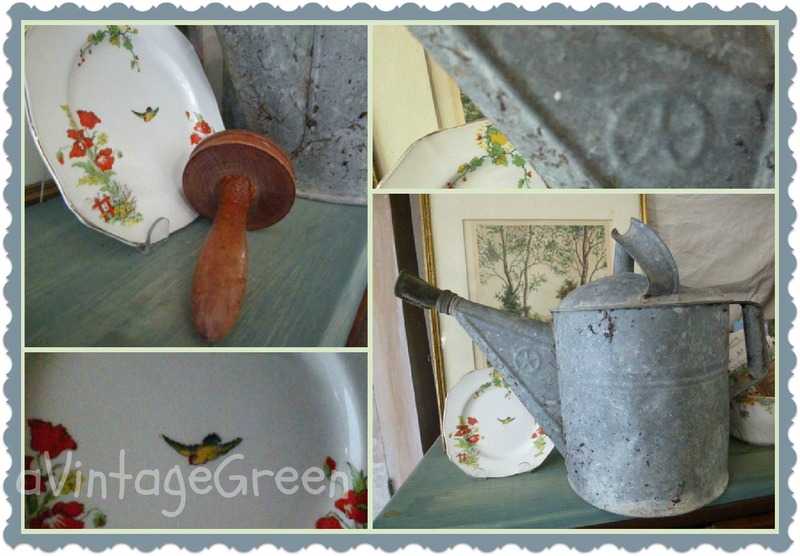 You have some truly wonderful vintage vignettes! I love the vignettes! What a great haul of treasure you found this week! I love doorknobs and darning eggs! Thanks so much for linking with us, I hope to see you again on Wednesday! Great finds! I love the suitcase ... so so interesting :) and yes, I have had a couple of surprises that were intended well but had to be redone later as not to offend feelings :) Thank you for sharing at The "Sunday Stop"! Wow some wonderful old things you have shared. Love the yellow knobs and I am crazy for that watering can. I like to collect them when I can find them reasonably priced which is not often. You snagged a good one. I display them indoors too. Thanks so much for linking up. I am ever so grateful. You really found some really great finds! Those yellow knobs are really cool, and love it your vignette. I also love watering cans and pick up anywhere I can! So glad you shared your creative inspiration with Sunday's Best! Vignettes are not a bad thing and cleaning and organizing definitely needs to be done while you're in the mood for it! So keep up the good work! Your vignettes are lovely! So many interesting and unique finds. My to do list(s) are as long as both my arms and legs lol! Thanks for sharing at my party this week! I love it! I was just thinking how pretty all your vignettes are... with the cute borders and the collages/mosaics. Is that Picmonkey editing? I bet you told us already but I can't remember. I know that so many are using it now. I think is also lets you add the professional looking frosted letter banner? That wooden cog wheel is wonderful and the knobs too... and the camera... Looks like you had a great weekend shopping! Thanks for sharing at my party last week! Oh my, you really found some treasures! Love that cog wheel and I too always pick up any watering can I run across. The camera is another of my favorites. I love your vignettes and your mosaics! Thanks for sharing with Share Your Cup. Hi, just wanted to let you know that I will be featuring you later today at Share Your Cup.